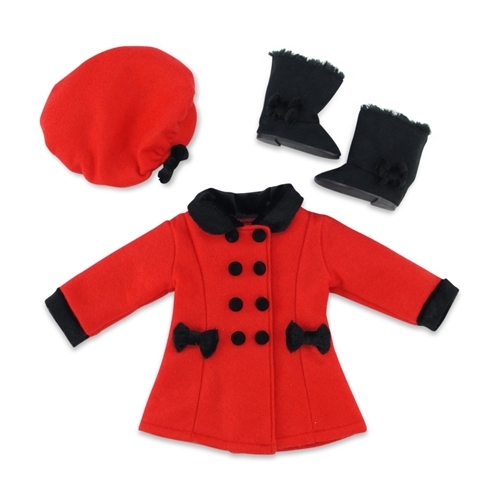 Your 18" doll will look so classic in this lovely red and black doll coat outfit! Perfect for a walk on a winter's day, this gorgeous outerwear outfit is sure to make your doll feel special. The coat is a beautiful shade of red, with large pretty black bows and buttons, and comes with an awesome matching beret style winter hat with black bow, for an elegant and special look! But that's not all! To top it off, this amazing doll outfit comes with cool black faux fur boots with matching black bow that can go with so many more outfits! The jacket has our special "no grab" Velcro closure, making getting dressed a breeze! This lovely doll outfit is perfect for your 18 inch doll's next outing. Doll clothing made to fit 18-inch dolls such as American Girl ®, Madame Alexander, Gotz, Journey Girls, My Generation, etc. Classic, one of a kind red coat/jacket with lovely black bow details, perfect for keeping warm on a cold winter's day! Gorgeous doll outwear set also includes matching red hat with black bow, and cool black boots that can be worn with so many outfits!